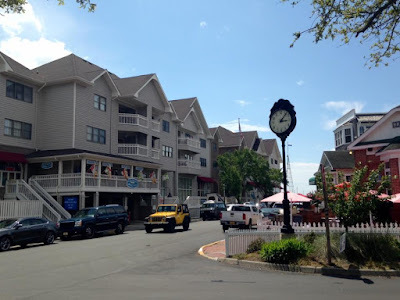 A personal glimpse of outdoor destinations in and around the Carolinas. All photos and content copyrighted. 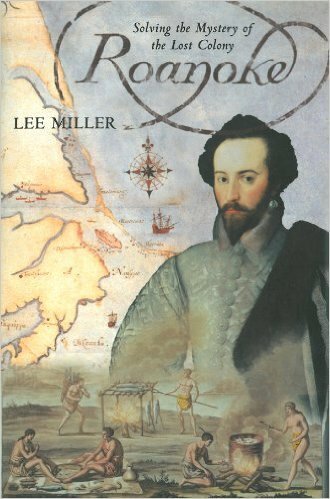 A few years ago, I wrote a post on the Lost Colony asking if Sir Walter Raleigh's second expedition, headed in part by Ralph Lane, set the third colony up for failure. Since then, I've done a lot of reading and have had conversations with individuals involved in researching the Lost Colony, and I now realize I barely understood the complexities involved in the interactions between Lane's expedition and the natives, and the disastrous chain of events--even mutiny--that lead to the disappearance of little Virginia Dare and the others left stranded on the shores of Roanoke Island in 1587. What I've learned since has been an eye opener. And there's still more to learn. In addition to Thomas Harriot's A Brief and True Report of the New Found Land of Virginia, I'm currently reading Roanoke: Solving the Mystery of the Lost Colony by Lee Miller. In it, Miller examines the root causes of the colony's disappearance in light of facts that cannot be separated such as circumstances in England, impending war with Spain, and the actions of Ralph Lane and others who accompanied him willingly or unwillingly on the second expedition. Miller provides facts, so many of them, that paint a vivid picture of the life the colonists left behind, the subterfuge that left them stranded on an island on which they were not meant to go, (and the disasters that nearly derailed their efforts before they even reached the island), the shipwreck along North Carolina's treacherous coast that lead to the shortage of supplies, and the dealings Ralph Lane and his men had with the Secotans and other nations on Roanoke and along the Pamlico Sound. For anyone interested in Raleigh's expeditions, Miller's Roanoke is a must read. We took it with us during a recent trip to Manteo to visit Fort Raleigh. Knowledge gleaned from its pages enhanced our visit along with a conversation we had with a gentleman involved in the search for the colony. 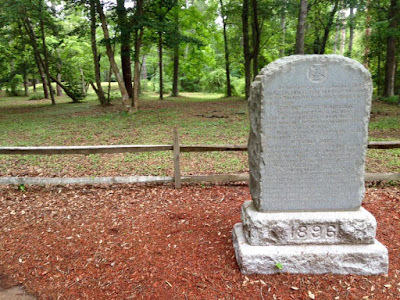 There is far more to this story than most people know, and that is, perhaps, what keeps the mystery of the Lost Colony alive. Shoreline along Fort Raleigh. What once had been land is now covered with water. Manteo, a charming island village of cottages and white picket fences. You can see them from the distance--solitary peaks rising from the the valley north of Winston-Salem. Quartzite remnants of old Sauratown. Monadnocks, or lonely mountains. Two such mountains in the old Saura Range are Pilot Mountain and Hanging Rock, both of which are now state parks. We were familiar with Pilot Mountain through a previous visit. But we knew little about Hanging Rock. Only that it had a waterfall. We were wrong. It has five. Since we were unfamiliar with the park, we stopped at the visitor's center, a building which fit perfectly into the mountain landscape. A ranger there provided me with a map and directions. The trailheads for three of the falls are conveniently located off the parking lot. Upper Cascade Falls is an easy .3 mile stroll over a wide path to a boardwalk that leads to the falls. Visitors can view the falls from the walkway or pick their way down stone steps to the base. If you choose the latter, please be careful. The steps are wide but steep and uneven. Even this adventurer wasn't willing to risk a fall that might have caused me to miss out on this. We had the place to ourselves on this visit, and after basking in the scenery, we headed to the opposite side of the parking lot to the Indian Creek Trail and our next two stops. The Indian Creek Trail itself is a 3.6 mile hike, but according to the ranger with whom I spoke, the round-trip hike to Hidden and Window Falls was approximately 1.2 miles. Indeed, Hidden Falls as listed as an easy .4 mile hike on the map, and Window Falls is listed as a .6 mile moderate hike. We quickly learned moderate at Hanging Rock generally means climbing a lot of steps. But it was worth it. Next, we backtracked through the park's main gate to visit Lower Cascade, located off Hall Road. The ranger's claim that it was the prettiest in the park was no understatement. But it is called Lower Cascade for a reason, and we walked down several sections of wood and then stone steps. Though it was a workout to reach the cove, our persistence was rewarded with a breathtaking view of a foamy white cascade falling into a shallow pool of water beside a massive rock face. Photos do the scene better justice than the video I took. Click on the image to see a larger version. Once again, we had the place to ourselves. We stayed for a while and then headed to our final stop--Tory's Den and Falls. If you're hiking with children, I wouldn't recommend this waterfall. Not only is it difficult to see given the angle along the cliff behind trees, the trail ends at an bumpy boulder that slopes down to a drop off. This is the great outdoors, so there is no railing to break a visitor's fall. The path is narrow as well, so there isn't much room. 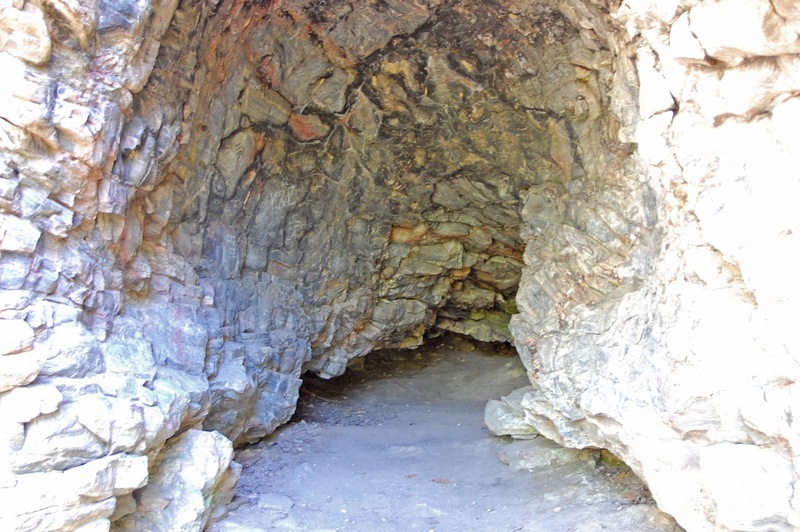 This is still a great stop though, as the opposite side of the trail leads to Tory's Den, a cave of historical significance. As Samwise, Pippin, and Merry learned in Fellowship of the Ring, if one is hiding from someone, one ought not light a campfire. As the story goes, in 1778, a band of Tories learned this lesson after they raided the house of a Whig colonel. They escaped, but a campfire gave away their position. Today, you can walk in the cave, which is more like an alcove. Lighting conditions were difficult given the bright sun shining outside the cave and the darkness inside, but I managed to take one rather bright photo that caught it all. In addition to hiking trails and waterfalls, Hanging Rock State Park offer bridal and mountain-bike trails, rock climbing, fishing, rowboat and canoe rentals, and vacation cabins and camping, seasons and weather permitting. I'm told the place stays fulls, so book early. For more about our camping trip at Pilot Mountain, click here and pop on over to my personal blog. A rustle sweeping through towering sassafras and oaks sounded like rain. I waited for drops to fall on the canopy of our tent. When the sound passed by like a Doppler wave, growing in intensity before fading out, I realized it was only the wind. Several leaves fluttered against the side of our new home-away-from-home, and I listened to the sounds filling the night air at Pilot Mountain campground with interest. We'd visited the park a few years after moving to North Carolina, but then, the purpose was to explore another one of the Old North State's stunning and unique geological landmarks. But family research that began several months ago with an Ancestry DNA test set off a chain of discoveries that showed me how deep my Carolina roots actually ran. 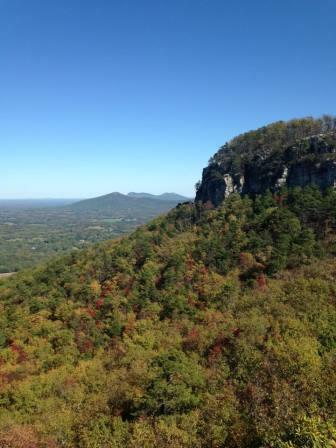 And one of those roots involved Pilot Mountain and the sprawling Yadkin Valley it overlooks. Today, the Yadkin Valley is wine country and home to several state parks that protect unique landmarks. However, in the past, the Saura Nation that once dwelled nearby called the mountain Jomeokee--the Great Guide. 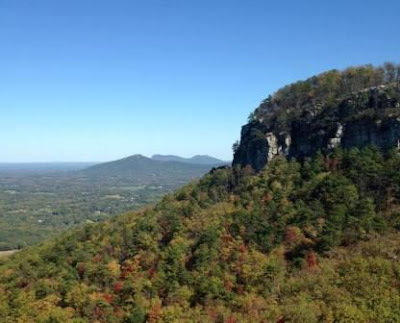 In later years, the domed peak now known as Pilot Mountain served as a navigational landmark for settlers migrating to the Yadkin Valley from Pennsylvania via the Great Wagon Road. 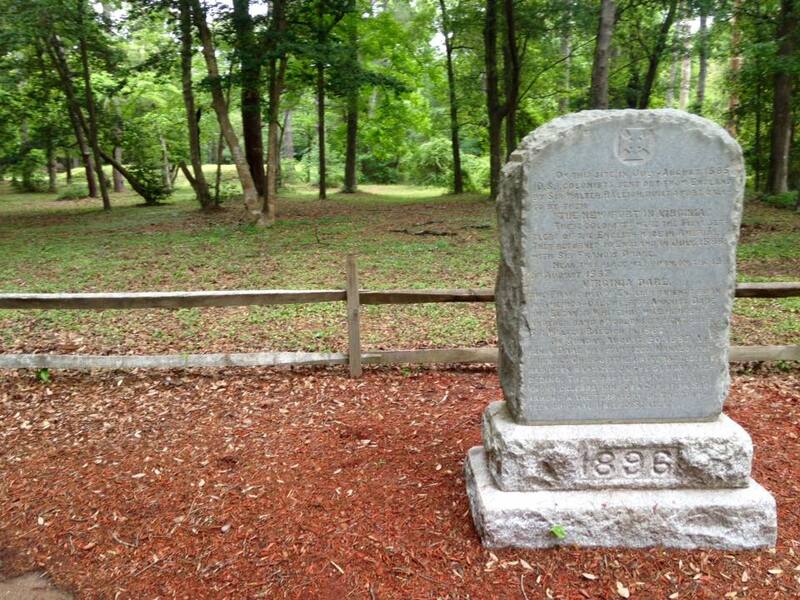 Settlers traveling down the Great Road in late 1751 or early 1752 included my 6th and 7th great grandparents. 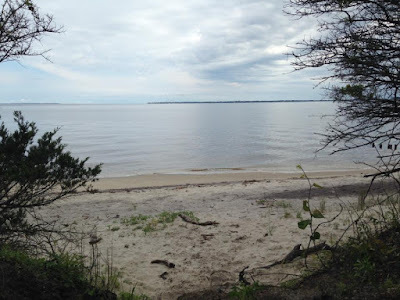 As my husband and I drove north one day during our camping trip, then later headed south, back to the campgrounds, I realized I was looking at the same view my ancestors would have seen over 260 years ago. 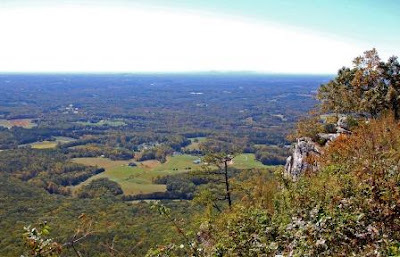 And when I stood in the parking lot near the summit of Pilot Mountain, I gazed out at the Yadkin Valley knowing I was gazing into my own past. It made our stay even more exceptional. But my own personal Jomeokee was only part of the reason of this trip. We visited another, nearby destination during our stay as well, and I'd like to think my ancestors also saw that towering peak as they made their way down the Great Road. So next up: Hanging Rock State Park. Photos are copyrighted and not available for use without express permission. Please be mindful of copyright laws when considering the distribution of anybody's blog post or photos.